Now, if you had listened to this podcast, and you’re a leasee or a small business owner, you’re probably thinking that can’t be something I can do… in a long term solution, that may have to be done eventually but not right now. Since this post is about providing tips on what can be done right now it’s got to be simpler and less intrusive on the structure of your restroom. This is what readily acheivable means. What is a Readily Achievable Accommodation? There isn’t any magical fixes, this is simply a matter of knowing what the laws are. We will cover four pictures. In this picture though, you can see how the sign blends with the color of the wall. The requirement for “contrasting color” applies not only to the pictogram and the lettering against the background of the sign but also between the sign and the wall. It’s understandable that the owner of this restaurant probably wanted signage that would blend into the color of his wall so as to be unobtrusive. But that does defeat the point, doesn’t it? For someone who is legally blind, they may not be able to see the sign is there if it’s too small. The large size of the sign contrasting with the color of the wall is meant to draw attention to the presence of the sign. An individual who is blind could then walk up to the sign and touch it, and read the braille or trace the lettering and understand if this restroom is or is not meant to service them. One of the most common requirements for the accessibility of restroom amenities is the height of restroom amenities. The point of providing these items to the public is so that the public can use them. Providing goods and services to everyone equally is the point of the ADA. The height is not the only dimension to be considered. Height is part of something called “reach range”. There’s not enough space to go over in detail how the reach range is affected by approach or over-reaches but in general, the California Code of References specifies that at least one of the each type of restroom amentities must be at maximum 40 inches above the finished floor. This means that if paper towels AND a dryer is made available than one of each must be at 40 inches to the operating point. For mirrors, this should be at 40 inches. For towels with controls, the control must be at 40 inches. For soap dispensers, the dispenser must be at 40 inches. The ADA 2010 simplified the knee clearance under sinks. This sink has an interesting design and probably meets the requirements for knee clearance. (I did not measure this sink). But just from looking at it, I see 2 other issues. The second issue has to do with the pipes wrapping. Wrapping pipes requires that the hot water input and the drainage be wrapped in insulating materials. From this picture, it’s clear that the sink on the left is wrapped. What isn’t clear is that that this sink is identical to the sink on the right. If one sink of all of them were lowered, then that would be the accessible sink. But if the dimensions of all the sinks are the same and there is no identifying sign that the sink on the left were otherwise the accessible sink, then this business might as well not have wrapped their sink. They are still at risk to having their customer be burned by the hot water pipes simply because there is little in way of identifying the wrapped sink. The second issue has to do with the bowl height. While the code says that the top of the sink apron, or the sink counter, shall be no higher than 34 inches. The issue isn’t just so the counter top is at 34 inches, but also so that someone can get their hands in the bowl to wash their hands or wash their face. The bowl looks to add 6 inches, so even if they had knee clearance at 29 inches which is the minimum, adding another 6 inches puts them at 35, too high to be compliant. There are three additional considerations, the clear floor space, the slope of the floor and the flush control. From the photo there are no obvious floor slope issues, but you can tell that the trash can is awfully close to the urinal. It may interfere with the clear floor space. This is a matter of policy, this large facility should instruct their janitorial staff to place the trash can somewhere else. Also visible from the photo is the flush control. You’d recognize this control to be automatic, as it has a sensor. But if this control should have an additional push button for added flushing ability, then this urinal control should be within 54 inches of the finished floor. Remember, 40 inches applies to the amenities. 54 inches is the side reach range if the wheelchair user reached up from the side of the chair. 48 inches is the front reach range. But seriously, give me some genuine feedback and let me know if this was helpful or if you would like me to cover a specific topic. If I get enough requests, I’ll take the time to write an article on it. 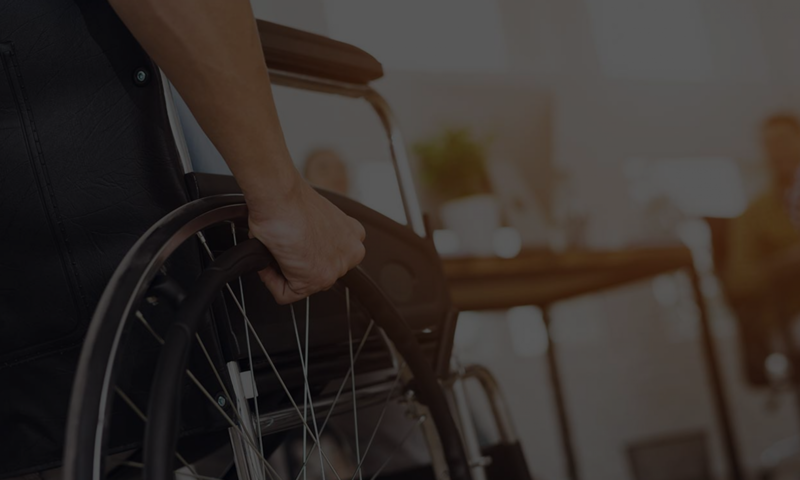 If you’re interested in having us apply our knowledge to your place of business/place of public accommodation in the form of an ADA consultation, by all means call us at 866 982 3212 or email us athelp@accesssolutionllc.com. **Note: The California Building Code may have changed its requirements since the writing of this article.